After showing images of a jailbroken iPhone 4S with Cydia installed, the iPhone Dev Team’s head honcho MuscleNerd has now shown a jailbroken iPad 2 running iOS 5. 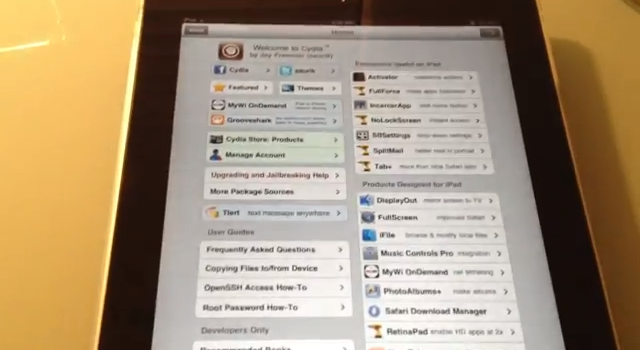 This video shows a quick demo of the very preliminary iOS 5 jailbreak on the iPad 2. The video can be seen below. There has been no set release date for this jailbreak to go public yet but at least we can see that it can be done. I am guessing that there will be one ultimate program like Redsn0w that will be able to jailbreak every device, including the iPhone 4S and iPad 2. Only time will tell.